This project of knowledge and dissemination brings an evocative moment of landscape painting to the public’s eye. Between the 18th and 19th centuries, the River Nera valley between Terni and Narni witnessed the extraordinary presence of artists from all over Europe. They immortalized famous but also unknown places consequently rendering the same famous. The works, now preserved in museums and collections the world over, offer a marvellous image of those places preserved down through the centuries. Through this special artistic heritage we wish to promote the knowledge and enhancement of this area in ​​southern Umbria. Between the 18th and 19th centuries Italy played a prominent role in an important chapter of art history. Artists from many parts of Europe; France, England, Germany, Switzerland, the Flanders and Scandinavian countries came to Italy to study the ancient ruins and masterpieces of the Renaissance masters. This was the period of the Grand Tour and of the Journey to Italy, an essential phase in the preparation and training of all artists. The painters arrived in Italy and were struck by the beauty of the landscape and the extraordinary Mediterranean light. They left their studios and started painting en plein air, in direct contact with nature, leading to an approach that, by changing both vision and painting techniques, would usher in innovative and modern solutions. The wonderful places portrayed in the paintings represent an image of Italy which had never been seen before, revealed for the first time by these foreign artists. Some areas of the peninsula were specifically portrayed: Rome and its countryside, the small towns of the Lazio hills, Naples and Sicily. An entirely new geography was traced out by the artists in these years. From Rome and Lazio some moved up towards southernmost Umbria, up to the valley of Terni, furrowed by the Nera river and crossed by the ancient Via Flaminia. Terni and its valley therefore become the northernmost outpost reached by the plein air artists who brought with them their revolutionary way of painting. Little-known locations such as Narni with its surroundings and the ruins of the Augustus Bridge, the village of Papigno and its centuries-old woods, lake Piediluco and the Marmore waterfalls, captured the attention of artists and these places became their favourite subjects. Full of charm and history they soon became a new destination of the Journey to Italy. Jean-Baptiste-Camille Corot’s arrival in the region in 1826 is worth mentioning. The landscapes of the Augustus Bridge and the Waterfalls painted by the French artist radically change the perception of these places. In the small format of Corot’s paintings, his modern capacity for abstraction combines with a monumental and heroic vision of nature. Anna Ottani Cavina, curator in 2001 of the exhibition An Enchanted Country. 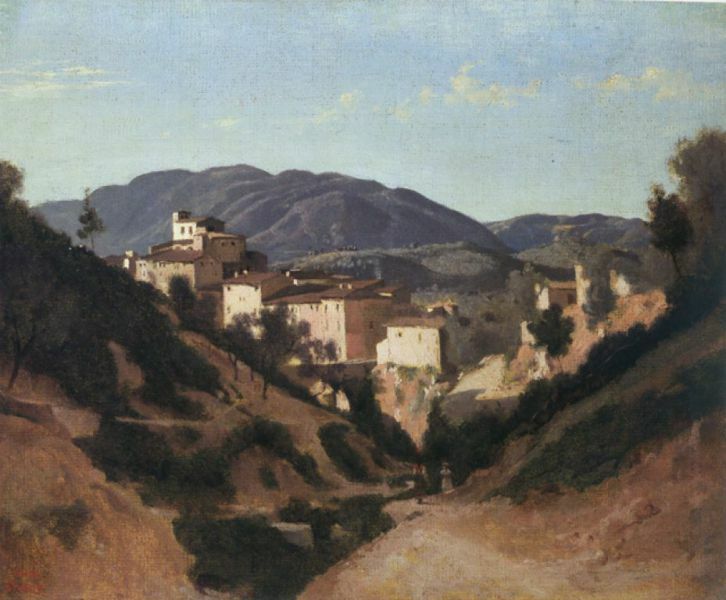 Italy depicted by Artists from Thomas Jones to Corot, (Mantua, Palazzo Te, Paris, Grand Palais) investigated the theme of the landscape perceived as nature and grasped the revolutionary approach of resorting to plein air painting, a systematic and inevitable practice for these artists. By clicking above you will find her opening essay of the exhibition catalogue that inspired the project on the plein air artists and the rediscovered places of an ‘enchanted valley’.